If you thought the speed gene findings were full of contradictions and facts not explained by the science, you will see that discussion was just a warm-up for this study on the published conclusions about the gait-keeper gene. First, this gene does not control if a horse trots versus pace--that factor has not yet been identified in the genome. What the gait-keeper gene does is it allows a horse to race at full speed at the trot or pace. 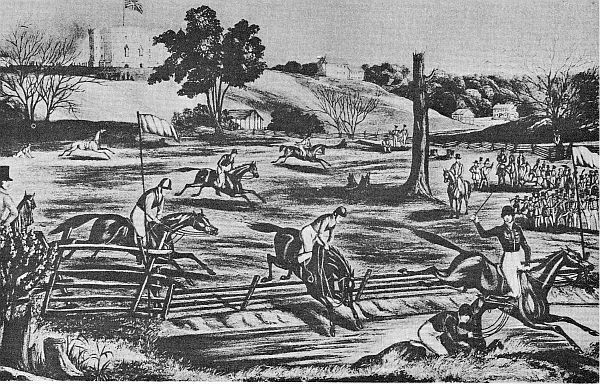 Above is a magazine illustration published at the time of the earliest steeplechase held in North America. This event was in Montreal, Canada in 1843, and you may be surprised to learn that the horses were not Thoroughbreds--there were very few Thoroughbreds in all of Canada at the time (Racing and Breeding in the Colonies 1931). What were those wonderful sport horses? They were Canadian Pacers and American Running Horses--North America's own home-bred sport horses--they were populations of mid-gait racing horses (pacers and trotters--AA). In 2012 Dr. Lisa Andersson and her team of geneticists published a paper on their findings concerning the 'gait-keeper' gene: "Mutations in DMRT3 affect locomotion in horses and spinal circuit function in mice". It was followed in 2014 with a flurry of papers by Kim Jaderkrist (student) and T. Kristjansson and their teams (see Genetic Studies sheet). The scientists then marketed their discovery through a test made available to the horse owners, providing a DNA test to determine if a horse carried the gene or not. In the marketing of that gene testing service (SynchroGait) they made statements and claims that went well beyond what this gene does, they went so far as to say the possession of the gene is a detriment to Olympic style sport. According to their literature the horse having this gene will not be able to do a balanced canter, will not be a good jumper, not a good dressage horse or eventer nor could it race well at the gallop. Wow--I bet you hope your horse doesn't carry this gene! Since then this author had several conversations with Dr. Andersson (in November 2015 via email) on the questions I had concerning some of the findings and their blanket conclusions, and you can find most of that exchange detailed in Standardbred Sport Horses. Ultimately, with my own body of historical research and pedigree tracing which tells an entirely different story than theirs, and after the discourses with Dr. Andersson, I came away with an understanding that the gene allows mid-gait racing, and that the horse with the gene may or may not have a good canter, and that it has no effect on the ability to jump. Right away from the initial paper's title you can see this gene is also classified by science as a mutation, based on the same reasoning outlined in DNA Studies and used in the speed gene evaluations--which is it is a mutation because the primitive horse does not carry it. In the papers the homozygous carrier of the gene is identified as AA, the heterozygous is CA, and those horses that do not carry the gene are CC (wild horse is CC). Realize CC covers a very wide branch of horse breeds and types, including the wild horses and heavy draft horses--horses that are truly unsuited for Olympic style sport. AA horses according to their website (www.capiletgenetics.com) are not able to perform as well as CC horses in eventing, galloping, dressage and show jumping--but history tells us otherwise. The papers' outline many of their findings and the assumptions the scientists made, but once again it is clothed in their wild horse working theory. Shortly, they had a testing service on the market, so that you could send in your horse's DNA sample and determine if it carried the gene. SychroGait at www.capiletgenetics.com. "Genetic tests provide horse owners with a modern and easy-to-use tool to plan breeding and the selection of horses for pleasure and competition."(SynchroGait). In the literature on the Capilet Genetics' website, the claims are made that AA is necessary for top racing speed at the mid-gait, but that it hinders Olympic style sport in all its forms including dressage, jumping and eventing, and that the horses with AA will have a less balanced canter--essential for dressage, and so it is a poor choice for a sport horse and as breeding stock for sport horses. Even CA horses were pointed out as being deficient for the Olympic style sports and their breeding--that their gaits would not be pure enough, clear or balanced enough, even for galloping. The selling point being made is you can test a horse before you buy it for the presence of the gene, and that it can save you from making costly mistakes as well as allow you to be more successful in breeding by avoiding all stock that carries the gene. The site also identifies the American breeds of Standardbred, Tennessee Walker and Missouri Fox Trotter as AA, and half of the Saddlebred as CA, and a quarter of the Morgans as CA. Are you getting the picture? What they are telling the sport horse world in a very strong presentation is that American sport breeds, across the board, are poor sport horses!! Trotter or Galloper? Planet RH (above) was both! One of the greatest all around sport horses of all time, Planet RH could race at both the trot and at the gallop. He even set records in four-mile heat racing (galloping), but he preferred to trot, and was often trained and conditioned for his galloping races by trotting three-minute miles up and down the track. He is also a powerful jumping line. Being able to race at the trot reveals him as at least a CA carrier, but more likely a AA, because he could hold his trot at full speed for as long as asked. Yet he is one of the best galloping stamina horses this country ever produced. Photo by Schrieber. So according to science our American breeds are really a negative choice for Olympic style sport---poor us! Our horses are no good for sport! But wait a second, isn't the greatest gold medal winning Olympic show jumper (Halla) half American Standardbred? And isn't the greatest modern day show jumping sire-line (Galoubet A SF) 1/4 American Trotter (Standardbred)? And weren't the best distance galloping racers, such as Lexington RH at least CA? (He and his sire Boston RH regularly produced trotters). And wasn't Planet RH, the top four-mile heat racer (gallop) right before the Civil War a trotter? And wasn't General Grant's favorite war horse in the Civil War (Cincinnati RH), both a four mile heat racer at the gallop and a good trotter? If you can race at the trot or pace you must have this gene--so what is the story here? Don't those Selle Francais people know that they can't jump their horses? Most of the Selle Francais is made up of CA horses--their base stock besides Thoroughbred and Anglo-Arab is Anglo-Norman (trotter) and the French Trotter--which is a great jumper on its own. And Galoubet A SF is actually 1/4 American Trotter as well. A lot of our dread breeds have entered the gene pool of the top Olympic style sport performers of Europe. Galoubet A SF public domain image provided by Wiki Commons. All these conclusions were used in the promotion of their testing service (SynchroGait). But with the Standardbred, a breed they say is totally AA--the historical and even current records show this was a hasty and a too narrow conclusion. Historically, the Standardbred and the Trotter before it are some of the best jumping and hunting horses in the world--and they have been so through the ages. Also in this country and in Canada the pacing stock was valued for its ability to jump as well, and they possessed such strong collection they were famous for being able to jump four feet from a standstill! On the subject of the canter it appears more than half of the AA horses here have a perfect three-beat canter naturally. Many pacing Standardbreds are also displaying an innate ability to piaffe and passage which are upper level dressage movements based on a collected trot--how do you explain that? Shouldn't someone tell Heather Caudill and her mount Whiz Bang ST (AA full Standardbred--a pacer) that the scientists say a canter pirouette is impossible for them to do, and that they have no business winning in open dressage contests either? Photo by Christie DeBernardis, taken at the World Equestration Games--used by permission. So what is going on here? As we saw in the rest of these studies--they are a work in progress. Many of the traits and abilities they claim as being ruled by this gene (SynchroGait) instead are coming from other genetic components--all other claims are an overreach. History has shown that AA horses can be superb jumpers and dressage horses--depending on the rest of the genetic traits they carry. All they can rightfully claim is the gait-keeper gene allows a horse to race at full speed at the mid-gait...it does not control jumping, it does not control collection, it does not control the ability to gallop (see Planet RH above)--so all those claims are an overreach. The scientists must isolate the gene in order to identify and study it, but our equines carry many genes and it is the various combinations that point to its unique locomotion expression. Some AA horses tend to have a four-beat canter rather than a three-beat canter, and they take some work to get it right. But just as many have a perfect three-beat canter from the get-go, and they need no special training to get it right because it already is, so it is clear the presence or absence of this gene is not the deciding genetic factor in the quality of the canter. And I find it very curious that no where in these studies is it mentioned how poorly many of the CC horse breeds, even many warmbloods, are at the canter or that many have a unclear four-beat canter and how hard they are to train to not only do a clear three-beat canter, but to hold it. And then of course we have the entire AA breed of Tennessee Walker and their normal gaits are a running walk and a CANTER. So the cut and dried conclusions of their study are incomplete, because other factors are operating in movement then what they have quantified so far. Many horses that are gaited, that is, have a trot or pace as their strongest gait, naturally prefer to travel in that mode. 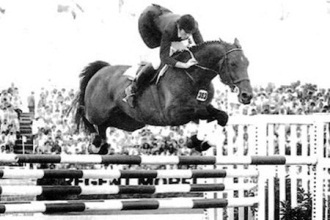 And there are several international level jumpers (Bionic Woman ST is an example--a full Standardbred--AA) who when approaching a jump drop out of a canter into a trot or pace--their strongest gait, to get the power for lift off. 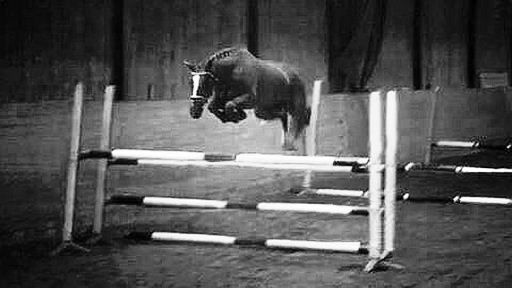 But staying in a canter is not a requirement of a jumper--the horse wins who clears the most jumps in the least time; that is the game--not a perfect three-beat canter approach with a jump added at the end. Bionic Woman ST was such a talented jumper she was also a winning high jumper. Thankfully jumping is on merit, not someone's idea of equitation--at least not yet. It is clear to me it is time for a revolution in international sport--a reset to a wider view. Who decided anyway that a dressage test must be walk/trot/canter? Why can't it be walk/fox trot or running walk/canter? Here in America we are blessed with gaited horses. Our original SPORT horse was gaited, and inspired breeders have kept the gaited horses in tact over the ages in several breeds. 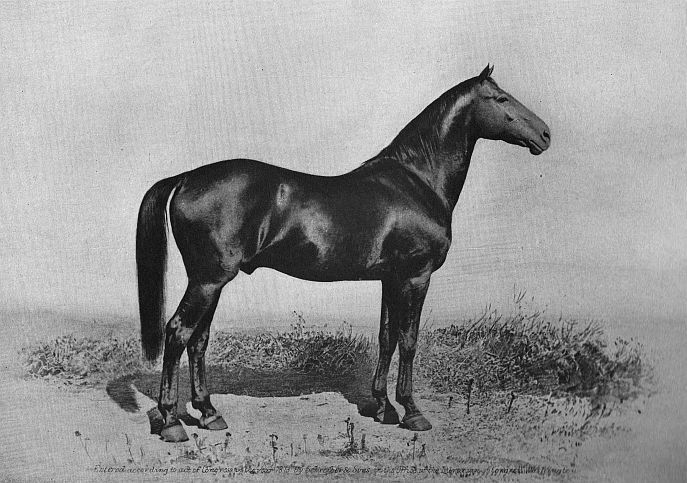 Further, the sport horse base breed of America was also the same breed that is the base of the Irish Draught, the Connemara Pony and the English Thoroughbred--it is the original source of the speed, stamina and jump. For centuries its was the most valued riding horse of the British Isles and so highly thought of they were given as diplomatic gifts to the heads of the European monarchies. And it was the genetics of those original gaited sport horses that have provided sport ability to every modern sport horse breed--including all those CC horses that can run, jump and do dressage today. Today with international sport being governed by an ever narrowing set of bureaucratic rules, with those making decisions arising from countries which have little history with gaited horses (or true sport horses), we find gaited horses are barred from the Olympic competitions because of their movement is judged as not 'right', and the ability to gait is classified as a mutation by science. Wouldn't you love to see them put the 'correct moving' Przewalskii Horse or the heavy draft breeds of Europe in a dressage saddle and show us how it should be done? They are CC after all--so they must be better at Olympic style sport than the American horse breeds. It looks like we in North America who have kept these NORMAL variations of equine locomotion alive and built breeds based on those movements, will have to demand our rightful place in the international arena as well. The cavalry is already mounting up on this here in North America with our equine enthusiasts organizing western and gaited dressage venues, and the growing popularity of these sports is just the beginning. We have already seen that science rules that gaits are a mutation--based on the wishful thinking Darwinists, that the primitive horse is its ancestor (see DNA Studies ). Maybe we should start realizing that the 'missing link' required by their theory just does not exist? And just maybe the domestic horse is naturally gaited; with all the variations in locomotion from a walk-trot-canter to an amble-pace-gallop being NORMAL? Historically this is the reality. By the way, that is my working theory on this, and I believe that 'we the people' in the land blessed with this wide spectrum of superb athletic horse breeds, which contain all the variations in movement, should be championing this broader view. If our sport horses and those of England and Ireland, as I believe the historical record proves, were originally gaited, then why are gaits being barred from sport contests? Isn't it time science re-examine their base premise? Re-calibrate their findings by assuming that gaited horses might be just be as normal as those that are not gaited? That perhaps our horses are displaying just one variation of the main movement traits the domestic horse carries? If nowhere else, then that should be the rule here in America, and we should elevate the gaited performer into the Olympic level. It is up to us. Update 1/6/2017: A coincidence? Sometime between 11/19/2016 and 1/5/2017 a major revision was conducted on the Capilet Genetics website. Before I wrote the above webpage I rechecked the Capilet site to see if any amendments had been made to the excessive claims on the sport limiting aspects of the gait keeper gene. I found it was the same as the year before; no changes had been made to their pages that I could see. And at that time (November 2016) there was still a separate page on the ridden Standardbred where they presented their judgment that it was an abysmal choice both as a mount and breeding choice for those wanting to participate in Olympic style sport. I had carried on discussions with Dr. Andersson the year before in November of 2015 on the erroneous blanket assumptions made especially concerning the Standardbred--a full year before I penned this page. At that time I provided her with ample evidence to the contrary of their overall claims, with both historical and current examples, so that she and her team could see there was a problem with their excessive claims for the scope of locomotion control this gene ruled. At that time, she had stated that other genetic factors present in a horse or even in an entire breed could completely change the expression of the gene, and she said some adaptions would be made to the site, because they did not mean it to come off the way I saw it, and perhaps it was not presented clearly. But a year went by and even though I had provided hard evidence, both historical and current for the benefit of her and her team, no changes were made in the damaging statements on their site concerning our sport breeds. On 1/5/2017 I happened to visit their site because I was rechecking a quote I made from there and found the page it was on had disappeared, and traffic to that previous page was directed to the generic 'gaited horses' page instead. The entire site appeared to me to have been modified and simplified with most of the inaccurate judgements on our breeds being removed or altered. For instance, the previously unequivocal statement that CC horses were the best choice for Olympic style sport had been amended with a 'probably'. CC horses cover many breeds, and many of those breeds are totally unsuited for Olympic style sport, but it is not the gait gene standing it carries that determines its ability for those sports, rather it is the other genetic factors resident in its genotype. 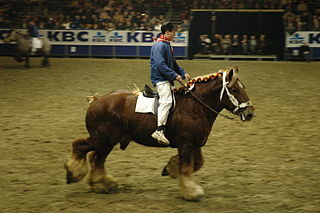 According to the published science on the gait keeper gene the Belgian Draft horse seen above (in a dressage saddle), who is CC for the gait gene, would be a far better jumping and dressage horse than the horse seen below. Image by agriflanders 2005, made available for public use via Wiki Commons. Seen jumping above is Caunis On, a full Standardbred--therefore AA. 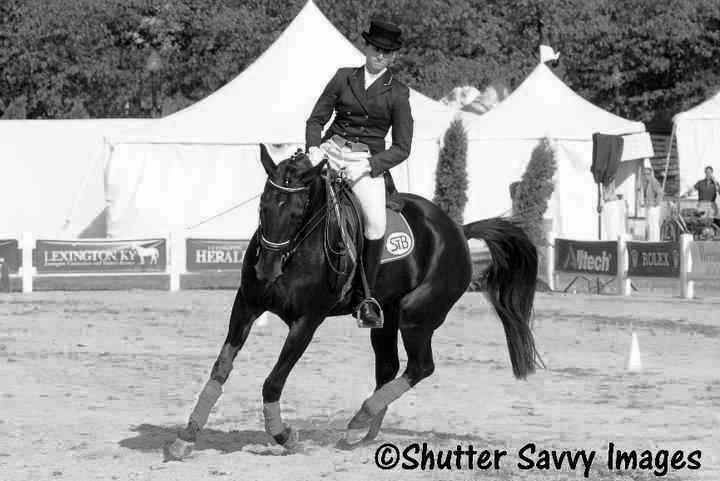 Caunis On and her rider-owner Jessica Jakobsson are regular winners in show jumping in open competitions in Sweden where the gait keeper studies were conducted. The scientists must of missed Jessica's performances when they were evaluating AA horses jumping and doing dressage--photo Jessica Jakobsson--used by permission. By the way, Jessica keeps three Trotters going at a time, competing in open competitions in dressage, show jumping, eventing and fun sports like Team Chasing, and even in the western disciplines--all her horses are off the track Standardbreds which she retrains. Somehow she and her horses have had no problem competing and winning in Olympic style sport for years. Unfortunately the statement: "CA Standardbreds have significantly better balance in canter and higher score for show jumping than AA horses" is still in place on the Capilet website. Perhaps they mean 'hunter classes' where equitation is judged with the jump, rather than show jumping competitions? The gait keeper gene does not control jumping, that is a separate genetic trait and a gaited horse may or may not have it, just like a gaited horse may or may not have the speed gene. For instance the Iceland Horse (used in Capilet's studies) carries neither the jump trait or the speed gene, just the gaitedness. Our Standardbred however carries more jumping traits than any other breed accepting or equaling its cousin the Thoroughbred. The gait keeper gene does not control collection either. So while those claims on their website may help their test's sales, it still is at best a very misleading statement for the breeders of show jumpers, eventers or dressage horses. The balance at the canter point may or may not be true, some gaited horses do have difficulty cantering clearly without training--especially those taken off the track where they are taught not to canter, but as I have said before, many more do a perfect canter immediately--naturally, and many CC horses can not do a proper canter either. Is is a coincidence the overreaching in the claims for what their gene test can provide you with was only altered after there was a public challenge to their statements on this website? I don't know, but it looks like it, and that in itself is disturbing--that hard evidence didn't do it--rather public exposure of their extravagant claims did. Where is the science in that?